This is the second in a series of quick-start Inform 7 tutorials using examples from Colossal Cave Adventure. More information about this tutorial series can be found here: A Quick-Start Guide to Inform 7. I said this lesson would be about objects, but we’re actually making “things”. It sounds informal, but it’s a technical term in Inform 7. Some food is a thing. Some food is a thing. Some food is in Inside Building. If the food were a singular object, such as a steak, you would declare it with “A steak is a thing.” instead. Inform will adjust the pronouns according to what you use. It would be a problem if you could pick up the forest and walk away with it. Fortunately, when an object is scenery, Inform automatically sets the “fixed in place” property as well as the “scenery” property. You can see this by compiling your source and then using the SHOWME debug command on the forest. The example is a fixed in place thing. The example is in At End Of Road. This will produce an object called “the example” which cannot be picked up in the At End Of Road room. A bird is a thing. A bird is in the small wicker cage. A supporter is like a container, but the player can place objects on top of it rather than placing objects inside it. Most supporters are pieces of furniture, such as tables and chairs. 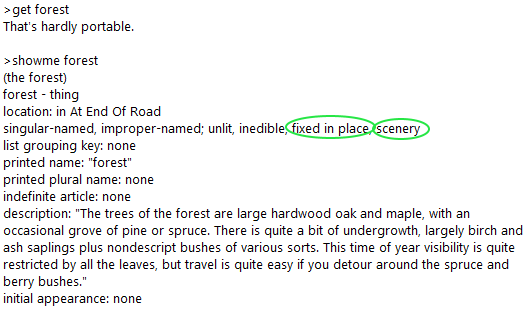 When playing Adventure, you can call the forest in At End Of Road a “forest”, but you can also call it “trees”. Understand “trees” as the forest. You can also call the forest “hardwood”, “maple”, “pine”, “spruce”, or a number of other things. Fortunately, you can combine all of the options you want into a single sentence. Understand “tree/trees/oak/maple/hardwood/pine/spruce” as the forest. Some food is an edible thing. …we can make it possible for the player to eat the food. Edible/inedible was reasonably obvious, but there are other properties (such as “openable”) that may be less obvious. 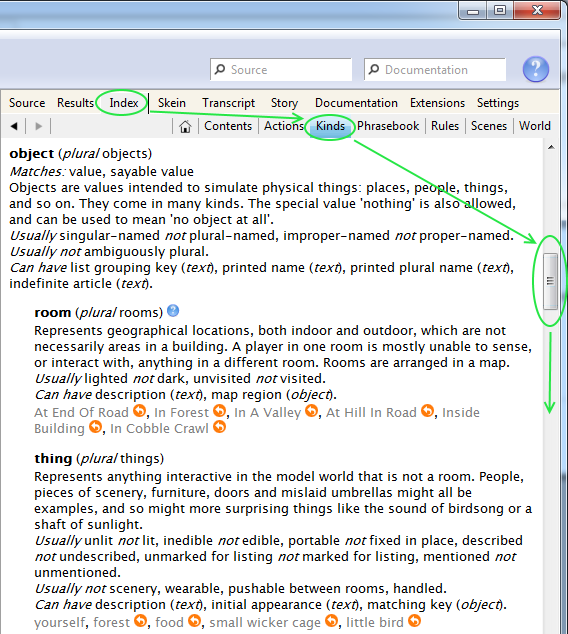 For a list of properties attached to things, containers, and supporters, go to Index and then to Kinds, and then scroll down until you find a list that starts with “object (plural objects)”. 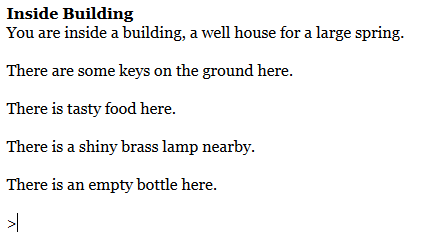 You can see a full list of properties here for every kind of object in your game. Searching the Inform 7 manual for the name of a property will give you more information about what it is and how it should be used. This lesson covered how to make basic objects, but the things in the wellhouse all have customized functionality. I’ll cover this ground in future lessons, but if you want to get started on custom functionality now, read chapter 4 (Kinds) and chapter 7 (Basic Actions) in the Inform 7 manual. It seems to me it’s a lot easier to program the entire game from scratch than use this tool. Colossal Cave Adventure – nice choice tho. It might be for you! But for most people, under most circumstances, it won’t be. In context, I assume that you already know how to code. Inform 7 is a natural language tool in large part because it was designed to be friendly for an audience of people who don’t know how to code. For someone with no coding background, the idea that you can type “A cave is a room” and have a compiling game is pretty huge. But apart from that – Inform 7 is an actively developed game engine that has been in development for 23 years. It’s not uncommon for people to create their own parser systems, but it is extraordinarily uncommon for those systems to be as advanced and easy-to-use as I7, or as well-supported with other technology. For example, most people who submit homebrew parser games to IFComp submit them as Windows executables, which reduces their audience significantly. Producing both a virtual machine executable and a web-playable file from the Inform 7 IDE requires a single line of code (“Release with a web interpreter”) and the website iplayif.com can convert any Z-machine or Glulx virtual machine package into a web-playable file. Although Inform 7 is the most popular English-language parser engine, it doesn’t exist in a vacuum. The most popular competitor to Inform 6 was the TADS system, and I usually recommend TADS 3 to users who prefer a more traditional system. Other well-known parser engines include ADRIFT, Quest, Alan, and HUGO.